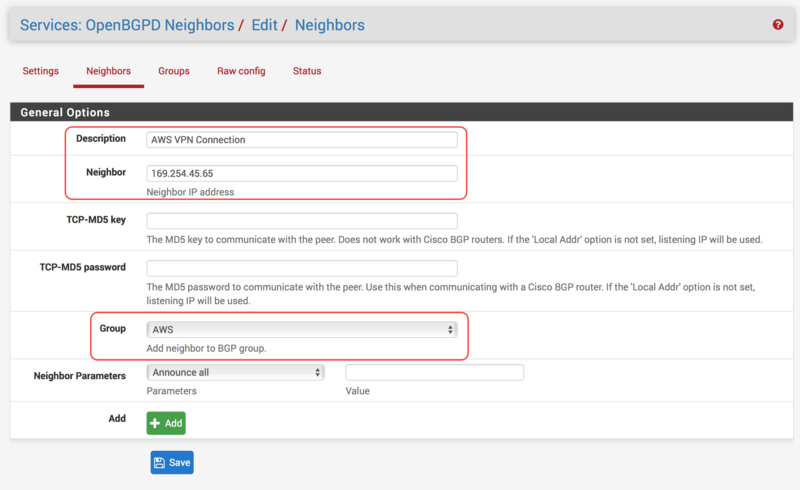 Have you ever wanted to access your private subnets in your VPC from your on-prem network, but couldn’t currently afford a Direct Connect line? Or maybe Direct Connect doesn’t fit your use case and you’re not sure what to do? Luckily for us, Amazon provides the capability to use a “Hardware VPN” to connect to your VPCs in AWS. However, the term “Hardware VPN” can be a little misleading. The reason Amazon uses this term is that customers will most often use hardware VPN appliances to connect to their services. These are devices made by Cisco, Juniper, F5, Palo Alto, etc. 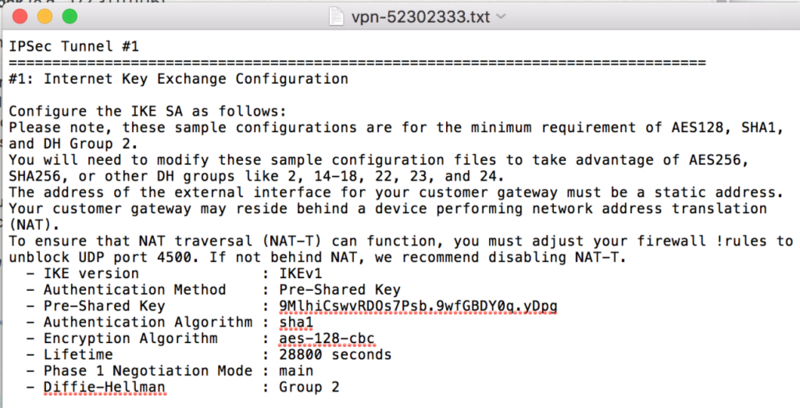 However, there are software VPN appliances that can use the IPsec protocol to connect to AWS. There are many different software appliances to choose from, but most notably are pfSense and VyOS. pfSense and VyOS are both Open Source networking appliance operating systems that can be installed on bare-metal hardware, or in a virtual machine. pfSense is geared more towards a firewall security appliance, while VyOS is more similar to a traditional router. Both are used by enterprises throughout the world. Today I’ll be covering how to configure pfSense to connect to a VPC in AWS. There are many steps, so make sure to read over them thoroughly and make sure you’re not missing anything. If you run into problems, double check your settings to ensure things are correct. 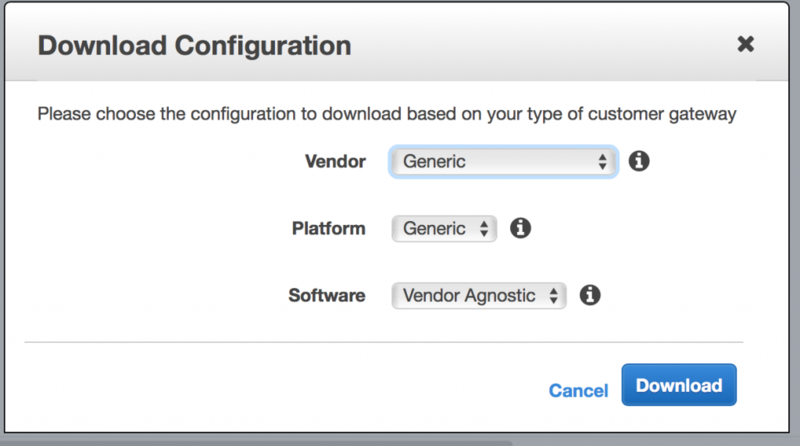 In the first half of this tutorial, we’ll be configuring some things in the AWS Management Console. The latter half will be configuring pfSense. Enter your BGP ASN number (If you don’t have a public one, choose any number between 64512-65534. These are private ASN numbers). Remember this number for later. Select your Virtual Private Gateway that we just created. Select your newly created VPN and click the Download Configuration button. Open the configuration file you just downloaded. We’ll use the information contained in it to configure pfSense. This will have two VPN connections listed. Whichever one you choose, make sure you’re consistent with it to make sure you are inputting the correct settings in pfSense. In the configuration file you downloaded from AWS, scroll till you find Inside IP Addresses and find the Customer Gateway IP. 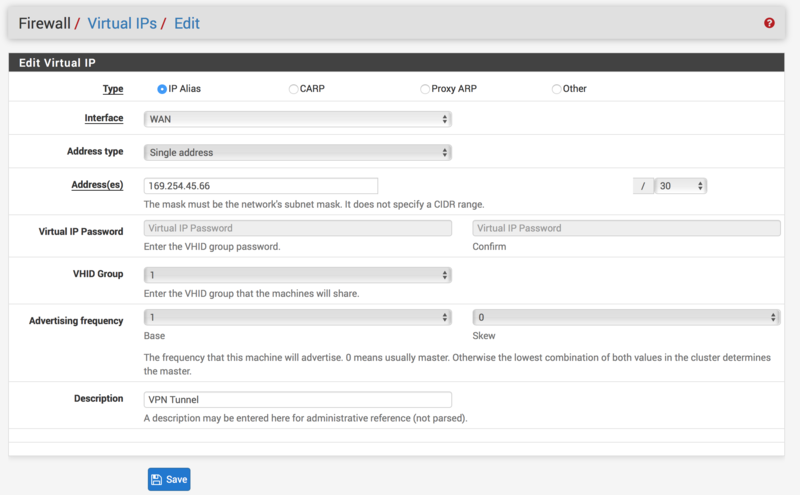 This be the Virtual IP we want to put in pfSense. Don’t forget the /30! In the configuration file you downloaded from AWS, scroll till you find Outside IP Addresses and find the Virtual Private Gateway IP. This be the Public IP we want to put in pfSense for the Remote Gateway. In your configuration file, find the section that says #1: Internet Key Exchange Configuration. You’ll need to double check the algorithms because they may change, but the rest should be the same. For Local Network, select Network and enter your Inside IP Address for Customer Gateway that’s found in the #3: Tunnel Interface Configuration section of the file you downloaded. Don’t forget the /30! For Remote Network, select Network and enter your Inside IP Address for Virtual Private Gateway that’s found in the #3: Tunnel Interface Configuration section of the file you downloaded. Don’t forget the /30! For PFS key group, set 2 (1024 bit). This corresponds to the Perfect Forward Secrecy section of the configuration file. 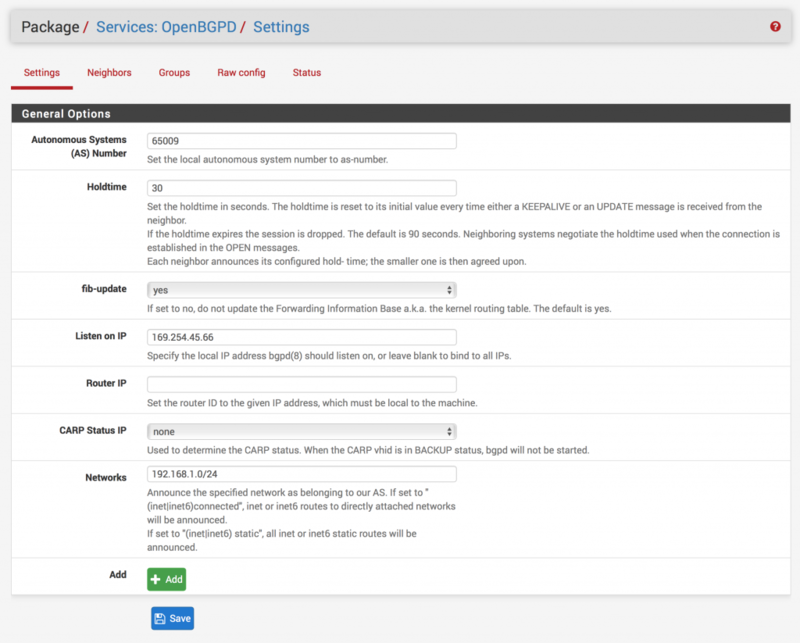 Go to Services -> OpenBGPD (All the following information can be found in the #4 Border Gateway Protocol (BGP) Configuration section of the downloaded configuration file). You don’t need the /30 here! After a couple of seconds, refresh the page and ensure the VPN status is ESTABLISHED. If it’s stuck on CONNECTING, double check your settings and try again. If everything worked right, you should see a connection time on the Up/Down column of the OpenBGPD Summary table and route information being exchanged. Back in AWS, we can go check our route tables for our VPC. In the console, inspect a route table. 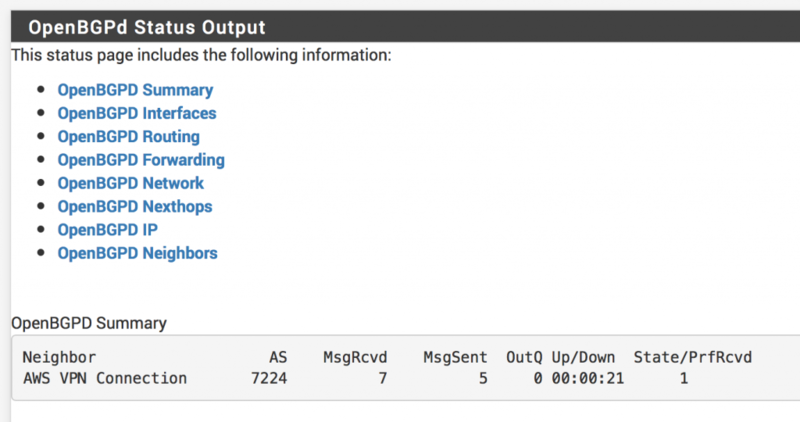 When you click the Routes tab, you should now see your routes from pfSense being propagated to AWS. Cool! On your EC2 instances, if your security groups are configured to allow ICMP and/or SSH from your on-prem network, you should be able to ping and/or SSH between instances in your on-prem network and AWS VPC! 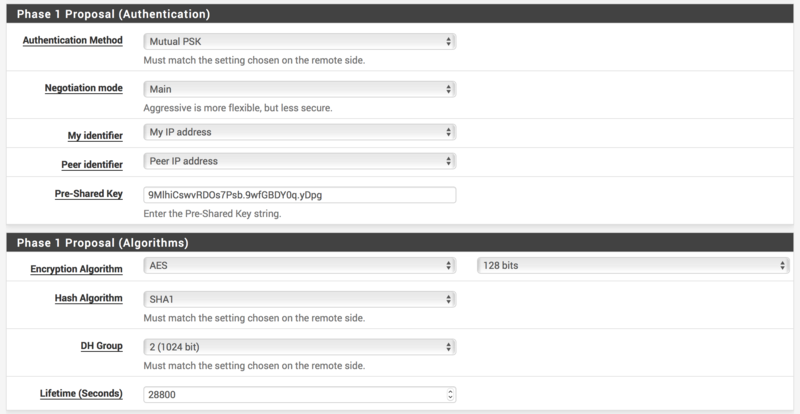 In my example, I have a Ubuntu VM running in my on-prem network and an EC2 instance running in my VPC. After configuring security groups, I can successfully ping between the two machines! In this tutorial we covered a lot of ground. 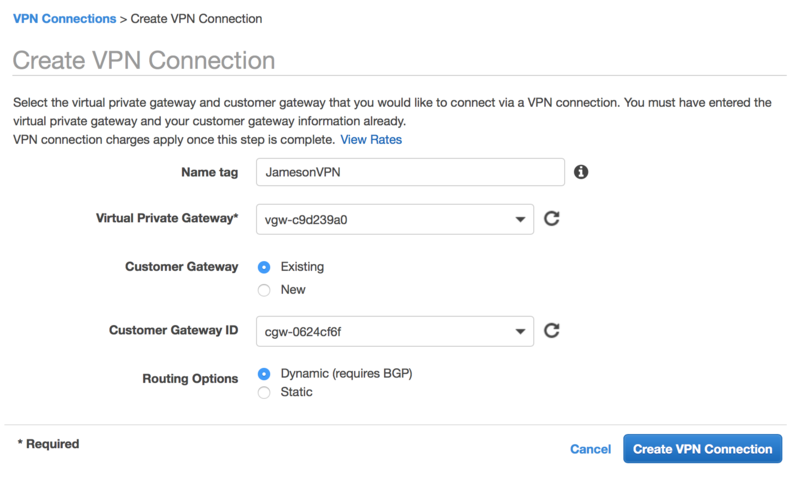 In AWS we created Customer and Virtual Private Gateways, attached a Virtual Private Gateway to our VPC for our VPN connection, and enabled route propagation to our subnet route tables. 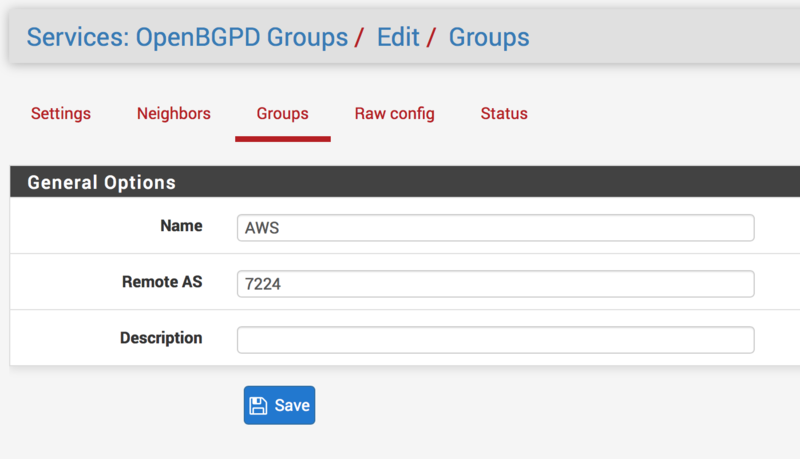 On pfSense we installed OpenBGPD, configured an IPsec VPN tunnel to AWS, and configured BGP to exchange route information with AWS. VPN connections to AWS can be a cost-effective alternative to a Direct Connect line. 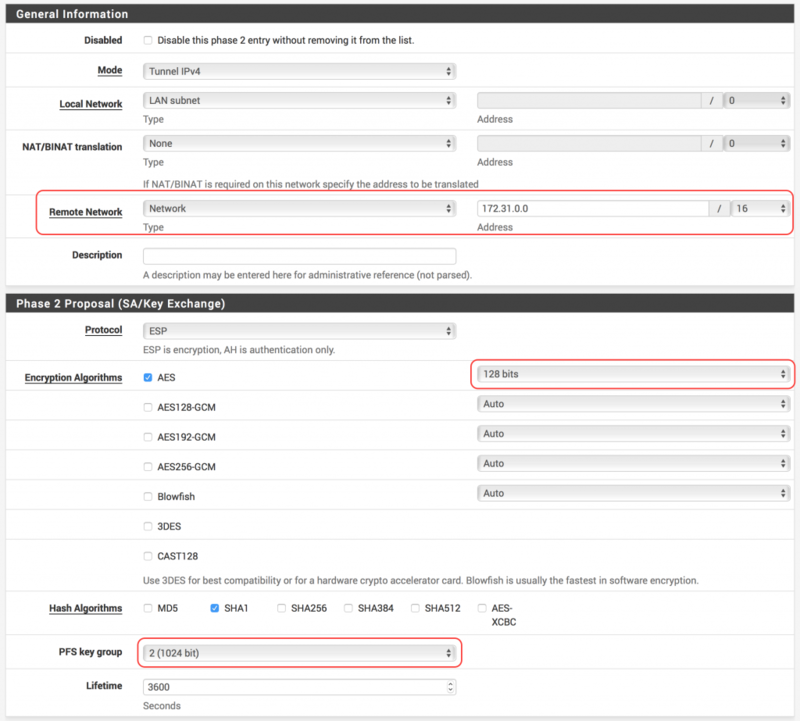 When estimating usage costs, remember to take into account VPN connection time and bandwidth charges in/out of your VPC. 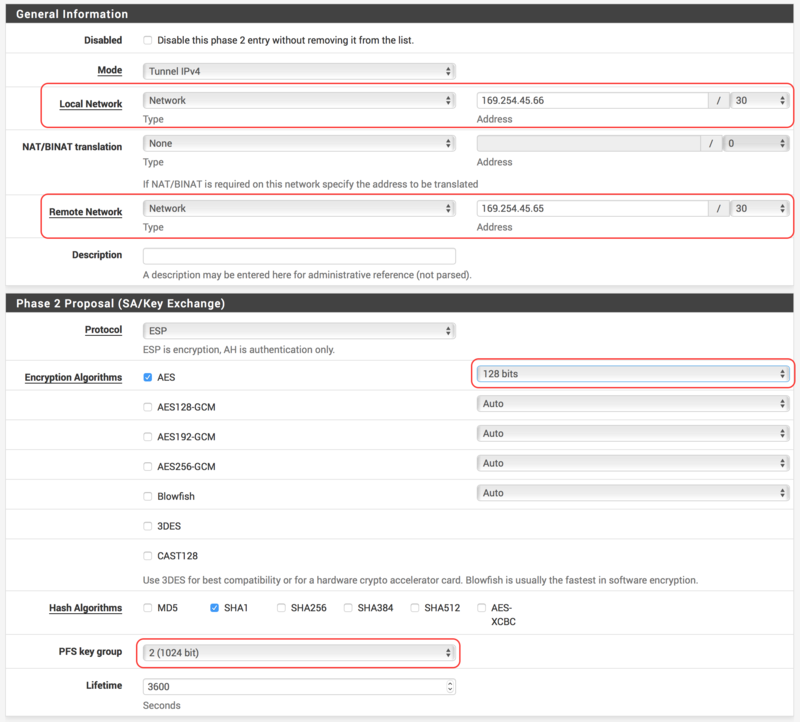 If you don’t need your VPN connected all the time, you can disable your VPN in pfSense when not in-use to lower your connection costs.